Please let me know how to refill the toner of the Canon IR2420 copier? We don't advise you to refill toner cartridges yourself as the toner powder they contain can be a hazardous material so we're unable to instruct you on this procedure. We do sell compatible toner cartridges for some printers which have already been professionally refilled. However, we only currently stock the genuine Canon C-EXV14 toner for use in the IR-2420 copier. The Canon IR-2420 is a space saver for the medium-sized office and it comes with reliable features for the time-conscious user because it is fast and prints directly from a USB thumb drive. It can also be upgraded for network scanning and printing, and those who have a limited budget can appreciate its affordable initial price and running costs. However, the absence of colour printing may compromise the productivity and the quality of output of creative users. 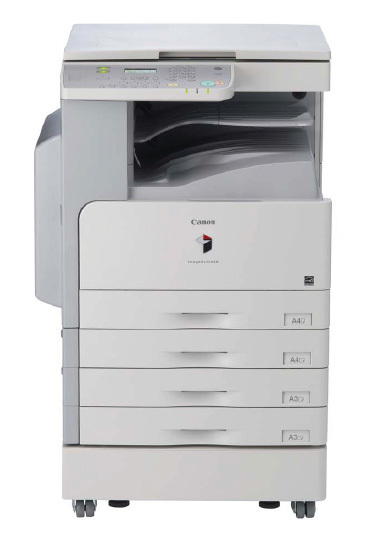 The Canon IR-2420 is a compact device designed for small to medium-sized workgroups. The understated frame measures 580.5mm tall, 638mm deep, and 622mm wide, and it requires installation space that measures 1018mm wide and 1249mm long. The device weighs 37.9Kg, but it can be installed on a stand with wheels for mobility. The IR-2420 has a standard paper capacity of 250 sheets for the default paper cassette and 80 sheets for the multi-purpose tray. The output tray can handle 250 sheets. Connectivity is via USB 2.0, and the entire device runs on 64MB of shared memory. A five-line monochrome display serves as the centrepiece of the operator panel. Up to 99 copies can be produced by the built-in copier. The paper capacity can be increased to 1,080 sheets with three additional paper cassettes. The Canon IR-2420 is easy to operate with a fairly large display screen, and it can be configured to suit the requirements of the workgroup. It is energy efficient for lower running costs. The print speed is up to 20ppm. The Canon IR-2420 warms up fast, and to save more time, users can print directly from a USB thumb drive. It has built-in rotate and group finishers plus the ability to staple the corner of finished documents. The Canon IR-2420 can only print in monochrome, and the resolution is limited to 600x600dpi, which may affect the quality of very detailed graphics or smaller fonts. Two-sided printing is an optional feature, which requires an upgrade but really should be standard on a printer us this type. The Canon IR-2420 can only be used as a scanner or as a network printer with upgrades and again the networking ability shouldn't be a upgrade. The device could be better if it had a hard disk drive for better built-in storage. Noisy operation might be a setback for some users.